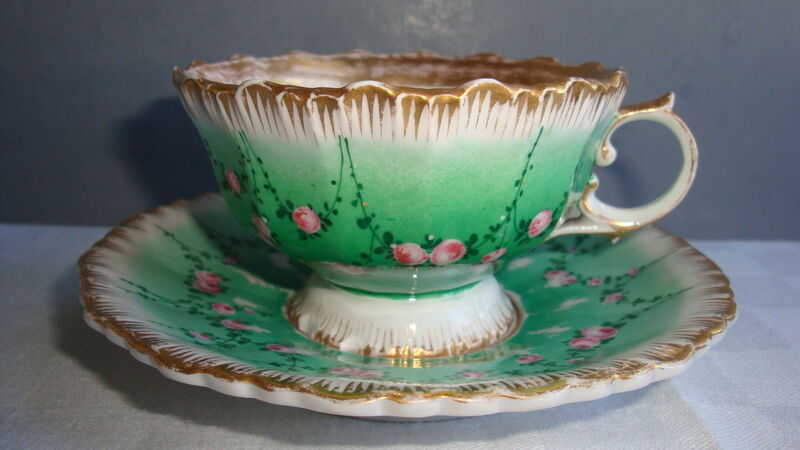 A reader recently contacted me with a photograph of a gorgeous tea cup that she owns. (Unfortunately I did not save her photo because I hadn’t planned on writing a blog about it). She wanted to know something about the mark on the base of the cup. I did some research and found that the mark identified it as a product of the FA Schmann Company of Berlin, Germany. The mark, SPM, was written in blue underglaze which was exactly as it should be for that company. 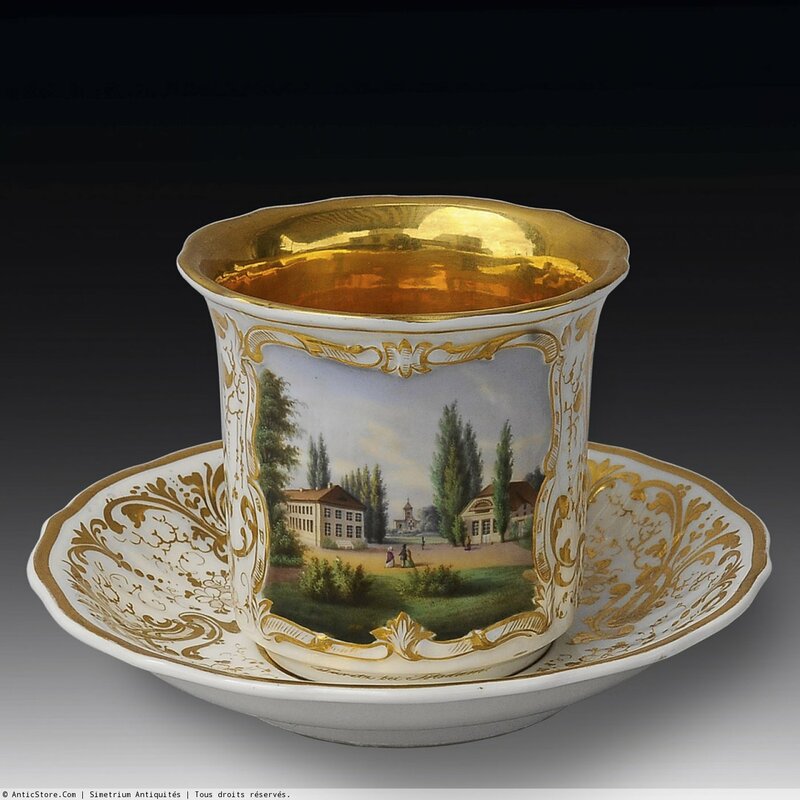 The cup in the photograph appeared to be made of porcelain as far as I could tell, and the style and extensive gilding of her teacup told me that it was probably made between the years of 1850 and 1870. It is easy for anyone to see that there is indeed a difference between the two examples, but is the difference really that significant? In spite of the fact that the reader’s cup and saucer was better than the first example I still would have put it in the category of $60-$75. However, I felt compelled to explain some of the factors that would account for such a variance in pricing so I thought I’d share these with you. Keep in mind these two cups are from the same company, but made at different times. The Mark is different: The absence of the eagle in the mark showed that the reader’s cup was made later and depending on the company’s business practices of the time it is possible that different materials were used or a variety of other decisions were made that could have affected their china. Serious collectors delve into the history of a company to unearth this kind of information before they pay top dollar for anything. Hand painted scenes on cups or saucers are always worth more, and even more if they are signed by a famous artist of the time. Technicians or factory painters were hired to paint overall designs but artists were hired to paint scenes. This accounts for a large difference in the price of these tea cups. Rarity is another factor. Perhaps for every five hundred cups and saucers painted by factory painters doing production designs there is only one scene-painted cup. One is so much rarer than the other and pricing reflects that. Another aspect is the type of item. This cup appears to be a coffee “can” because there is no handle. This again would be more rare. Condition is important. Perhaps the $35 cup had a slight chip (?) and this would certainly make a difference in value. Cups and saucers such as example #2 would have been very expensive even back when they was made. Because of this, their owners would have taken excellent care of them. These items were meant to show off behind glassed doors, not for drinking tea or coffee in. The location of the object for sale often changes perceived value. A product that has been made in a particular country will always be worth the most in that country. For example, Americans will always prize American products more than European, so their prices will be higher when selling in the US rather than outside the US. There are exceptions of course but overall this can be true for any country. Finally, some people charge as much as they possibly can for antiques and there is often someone who has not done their homework and pays the asking price. So before you get disappointed or think you can quit your job when you see a price for something you own, it’s a good idea to do a bit more sleuthing! I was wondering if you could tell me anything about the swords crossing symbol on the bottom of my dinner set and figurines. My grandfather is German and acquired them during WWII. Thanks! Thanks for the request. The crossed sword mark can mean many things because it is one of the most copied marks on china. You have given me an idea for a blog entry check out my entries in the third week of August. Do you have any pictures you would like to share that I can use as an example? A very informative post. Have 2 fruit platters with SPM and eagle, never really knew where they came from but suspected they where from Berlin. Thank you so much for enligthen me. Kovels “New Dictionary of Marks” shows the SPM mark with eagle above it as products made by F.A. Schumann, in Berlin, Germany. The mark should be in blue and sit under the glaze. This mark indicates the wares were made between 1851 and 1869. Thank you. It’s blue, under the glaze and just a little wear on some of the gold, otherwise no chips or any damage. Remarkable they have survived 150 years in the family. Best wishes for your holidays and christmas. You are most welcome. Christmas wishes to you too. such an informative post, Johanne. I just forwarded the link to others.Thank you. Thank you! Considering how many teacups there are out there in people’s homes I totally understand why it can be quite confusing to know which ones are worth more than others.